"A canine pancreatitis diet is considered essential for treating pancreatitis in dogs with studies showing that dietary change can extend the life of the patient. Proteins need to be minimized with increased emphasis on carbohydrates. The goal is to minimize the triggering of enzymes that cause inflammation. Commercial gastrointestinal dog foods and natural herbal supplements that contain milk thistle have a long history of helping with pancreatic conditions." A canine pancreatitis diet is necessary for the recovery of a dog with pancreatitis. Being overweight is considered one of the risk factors, with 43% of dogs with pancreatitis suffering from obesity. The cause of this condition is unclear. The condition can be helped by dietary change. During an attack of pancreatitis, your dog will be fed nothing by mouth. Fluids will be given by IV or subcutaneously. This allows the digestive system to rest. As your dog begins to recover, oral fluids will be reintroduced, a little at a time. If your dog is able to tolerate oral fluids, then small amounts of a bland diet will be offered. Small amounts fed multiple times per day are preferred to one or two large meals. Pancreatic enzymes are triggered by certain gastrointestinal hormones, including gastrin, secretin, and cholecystokinin (CCK). These hormones are triggered by fatty acids and certain amino acids. You don't want to trigger the pancreatic enzymes, because that can lead to further inflammation of the pancreas. Therefore the foods you feed your dog must be foods that do not trigger these enzymes including many foods made from humans. Carbohydrates have a weak effect on the gastrointestinal hormones the trigger the pancreatic enzymes, so they are a good food to introduce after your dog has had pancreatitis. Rice is a highly digestible carbohydrate and can be fed in small amounts. If rice is tolerated, then you can add some easily digestible, low fat protein, such as low fat cottage cheese or boiled skinless chicken breast. It is important to stick with low fat foods because fatty foods can lead to further inflammation of the pancreas. Some dogs have pancreatitis once and have no further trouble with their pancreas ever again. They are able to return to their normal diet. Other dogs have repeated problems with pancreatitis. They require an on-going special diet. Many vets recommend that once your dog has suffered an episode of pancreatitis, he should be placed on a canine pancreatitis diet. A canine pancreatitis diet is low in fat. Nutritionists say that less than 18% of the energy in such a diet should come from fat. Based on this figure, many diets designed to manage gastrointestinal problems are not suitable for a canine pancreatitis diet. Ask your vet what brand of food you should be feeding your dog. A prescription diet is probably necessary. You should not feed your dog table scraps and should feed treats sparingly, as these are often high in fat. Many dogs with pancreatitis are overweight. A low fat diet combined with an exercise program may help reduce the risk of future problems. Hill's Prescription Diet i/d is made specifically for dogs with gastrointestinal problems such as pancreatitis. 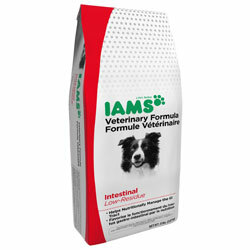 Iams makes an alternative option called Iams Veterinary Formula Intestinal Dry Dog Food. Both require a prescription and should be discussed with a veterinarian. Herbal supplements have a long history of helping the entire digestive system including the liver and pancreas. An excellent choice to research is PetAlive Liver-Aid which contains milk thistle, burdock and Celandine. These are all natural substances with a long history of use. Consult your veterinarian who can monitor progress and advise you on the use of these types of products.